March 2015. Vacation time was upon us. My wife, Theresa, andI had been cheerfully anticipating a first-ever trip to the coast of Georgia,including a day spent fishing with Capt. Greg Hildreth who owns Georgia CharterFishing (www.georgiacharterfishing.com), a full-service guide business foranglers who want to fish the coastal waters around St. Simons Island, SeaIsland, Jekyll Island and Brunswick. Theresa and I had lots of fun things on our week’s itinerary:wildlife photography in several national wildlife refuges, tours of severalEast Coast historic sites, a day out on a casino boat and much more. But as faras I was concerned, the one day we’d set aside to fish with Greg was going tobe the highlight of the trip. It seemed, however, that was not to be. When we leftArkansas for the drive to Georgia, I called Greg to check in and report on ourexpected arrival time. I was crestfallen. When conditions are good, Greg puts hisclients on a wide variety of popular Atlantic sportfish: monster sharks andtarpon, big brawling redfish, and good-eating fish like flounders, speckledtrout and sheepsheads. I was especially hopeful we might be able to catch sometripletails, a common Georgia saltwater species I’ve never had the opportunityto fish for. Everything seemed to be conspiring against us, however—highwinds, rough seas, rain and poor water conditions. But Greg offered analternative that might just save the day. Honestly, I’d never heard of whitings, but a fishing tripfor little fish is better than no fishing at all in my book. So whitings itwould be. Greg and I arranged a meeting place for the next morning. When Theresa and I arrived at our motel that night, I lookedup whitings on the Internet to learn more about them. 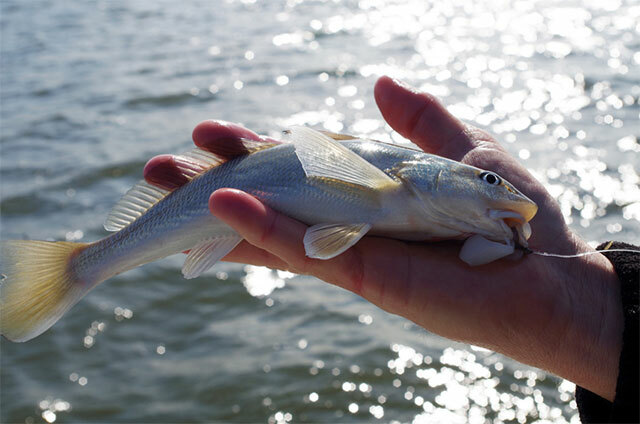 Turns out that whiting isjust one of many common names for this little marine fish. Some call themchannel mullets, sea smelt or kingcroakers. But the official common name iskingfish. And there’s not just one kingfish, but three: the southern kingfish (Menticirrhus americanus), which we’dfish for in Georgia, plus the gulf kingfish (Menticirrhus littoralis) and the northern kingfish (Menticirrhus saxatilis). 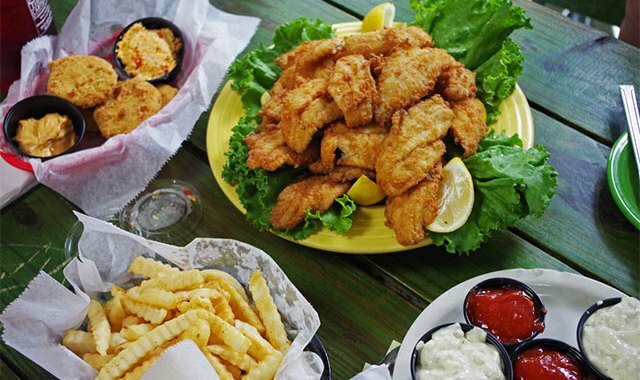 All three aremembers of the drum family, which includes popular saltwater sportfish such asredfish, black drum, spotted seatrout and croakers. And all three are bottomfeeders with small downturned mouths that eat small crabs, shrimp, amphipods,sea lice, small clams, snails and lots of sea worms. They have almost the samerange. The southern kingfish is found from Massachusetts to Argentina. The gulfkingfish is found from Virginia to Brazil. The northern kingfish ranges fromMassachusetts to Brazil. Except for slight differences in coloration, the three speciesare very similar. All grow to a maximum length of about 18 inches, but 10- to14-inch-long individuals weighing from one-half to 1.5 pounds comprise most ofthe catch. IGFA world records for the three are 2 pounds, 13 ounces for thesouthern kingfish; 2 pounds, 7 ounces for the northern kingfish; and an even 3pounds for the gulf kingfish. They like muddy sand or sandy mud bottom, wheretheir preferred foods are found. And all are shallow-water fish, most common inlower bays and shallow offshore waters, often in waters shallower than 15 feetdeep and seldom deeper than 80 feet. Late summer fishing often produces the best results, but asGreg promised, the “whitings” were very cooperative during our March fishingtrip. We baited the small hooks on our weighted bottom rigs with pieces ofsquid, and were landing fish within minutes of arriving at our fishing hole.Other baits often used include clams, bloodworms and shrimp, and many fans liketo chum good kingfish holes with clams to draw the schools in. There’s nothing exciting to say about the actual fishing wedid that day. The kingfish we hooked didn’t fight hard. They didn’t jump. Theydidn’t splash. They barely bent the light fishing rods we used. But beforenasty weather forced us off the water, we caught a few dozen, and we enjoyedvery much our few hours on the water with Greg. All of us, however, wished someof Georgia’s bigger sportfish had been in a feeding mood. When he was done, he proved it. We all cleaned up and thenheaded for Gnat’s Landing, a popular restaurant with a laid-back islandatmosphere and friendly staff in St. Simon’s. There, the head cook, a friend ofGreg’s, took the big bag of fillets from all those kingfish into the kitchenand prepared them for us. And for the next couple hours, we stuffed ourselveson delicious, deep-fried morsels that gave new meaning to the name “kingfish.”That meal was fit for royalty, for sure, and never again will I pass up anopportunity to go fishing for these often-overlooked denizens of the sea.